Like a good 17th-century pamphleteer, Clarkson denies that protest is effective but doesn't discourage his supporters from agitating in his defence. 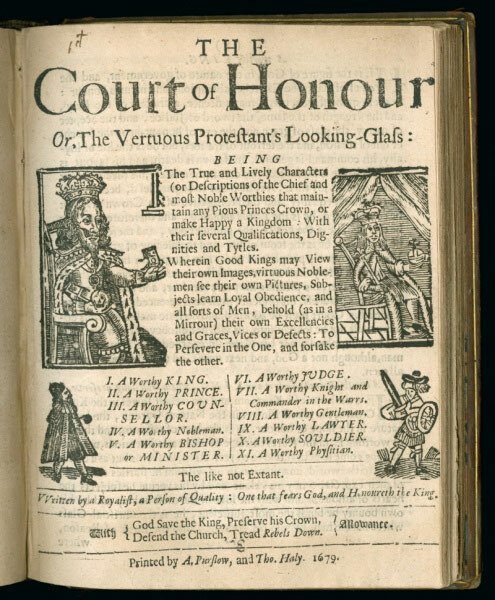 Court of Honour, or, The Vertuous Protestant's Looking Glass. 1679. The fault lines in the furore over Jeremy Clarkson’s suspension by the BBC, following allegations of a ‘fracas’ with a producer on the TV series Top Gear, have largely been drawn between those who view the presenter’s outspoken persona as a welcome antidote to ‘political correctness’ and those in favour of his dismissal, who see this incident as the final straw following a long series of controversies involving the programme. Both sides in this dispute have sought to invoke public opinion in support of their cause: the Guardian columnist Owen Jones has pointed to polling data, which shows that a greater proportion of respondents believe Clarkson should be sacked than think he should be reinstated. Clarkson’s supporters on the other hand have secured over one million signatures to an electronic petition defending the Top Gear presenter’s ‘freedom to fracas’. This represents the largest British e-petition so far, easily surpassing the near 600,000 who subscribed to an online petition in 2007 on another car-related issue, opposition to the then Labour government’s road-pricing policy. We might pause here to reflect that the last time Britons subscribed to petitions in such numbers, it was in the 19th century, to demand democratic rights as embodied in the Six Points of the People’s Charter. (The second Chartist National Petition of 1842 – six miles in length and weighing over 300 kilos – was so big that it had to be dismantled before it could be brought into the House of Commons.) The right to petition has long been identified as one of our sacrosanct civil liberties: the right to petition the Crown was enshrined in the English Bill of Rights, a response to James II’s decision to prosecute his bishops for seditious libel for having the temerity to petition him in 1688. Before we bewail the cultural malaise which has induced over a million people to exert this treasured freedom in defence of a wealthy television personality, it is worth noting the historical parallels between the pro-Clarkson petition and its early modern equivalents. The petition in support of reinstating Clarkson has been put together by the right-wing blogger Guido Fawkes, aka Paul Staines. Like Clarkson, Staines writes a column for the Sun, a tabloid newspaper that supports the Conservative Party. Clarkson himself is a friend of the Conservative Prime Minister David Cameron. Similarly, as the work of historians such as Mark Knights and John Walter has demonstrated, mass petitions in the 17th-century were often the product of cabals of activists, who exploited these texts as lobbying devices, bringing pressure on MPs, ministers and the Crown. To counter the political threat of mass-petitioning, the ‘Cavalier Parliament’ passed the Tumultuous Petitioning Act in 1661, which restricted the number of individuals who could present a petition and placed limitations on petitioning to change the established laws in Church and state. Despite the proviso in the Bill of Rights protecting the right to petition the Crown, petitions to Parliament continued to be regulated by this legislation until the act was finally repealed in 1986. These limitations on popular petitioning point to another parallel, here between Clarkson’s claim that ‘protest never works’ and early modern attitudes to popular petitioning. Both Whig and Tory parties initiated and encouraged mass petitioning campaigns as a means of exerting political influence but commentators on both sides were usually careful to avoid suggesting that the disenfranchised had a direct stake in the political process. While the ‘voice of the people’ was to be heeded, this was articulated by propertied freeholders, not the hoi polloi. Consequently, when the radical propagandist Daniel Defoe invoked ‘people power’ to defend the Kentish petitioners imprisoned by a Tory-dominated Commons in 1701, he chose a scriptural allusion – the Biblical demon ‘Legion’ (Mark 5.9 ‘My Name is Legion, for we are many’) – which revealed his own ambivalent relationship with popular politics. Clarkson then, like a good 17th-century pamphleteer, denies that popular protest is effective but, at the same time, does nothing to discourage his supporters from petitioning in his defence​ or staging demonstrations for his reinstatement. We should be sceptical, as were contemporaries in the 17th and 18th centuries, when political journalists claim to represent the authentic public voice. Even so, for any right to petition to be of value in a democratic society it must be open to all. It may be a sign of the health rather than the sickness of our democracy that it can accommodate mass petitions in defence of both British badgers and the man who once described them as ‘smelly, diseased black and white rat[s]’.